Mad Max: Fury Road (2015): Dir. George Miller. Written by George Miller, Brendan McCarthy, and Nick Lathouris. 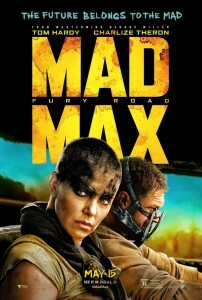 Based upon the film franchise Mad Max created by George Miller. Starring: Tom Hardy, Charlize Theron, Nicholas Hoult, and Hugh Keays-Byrne. Rated R for intense sequences of violence throughout, and for disturbing images. Running time: 120 minutes. If last year’s The Rover was the chamber drama of post-apocalyptic Australian westerns, then Fury Road is the genre’s grandstanding opera. 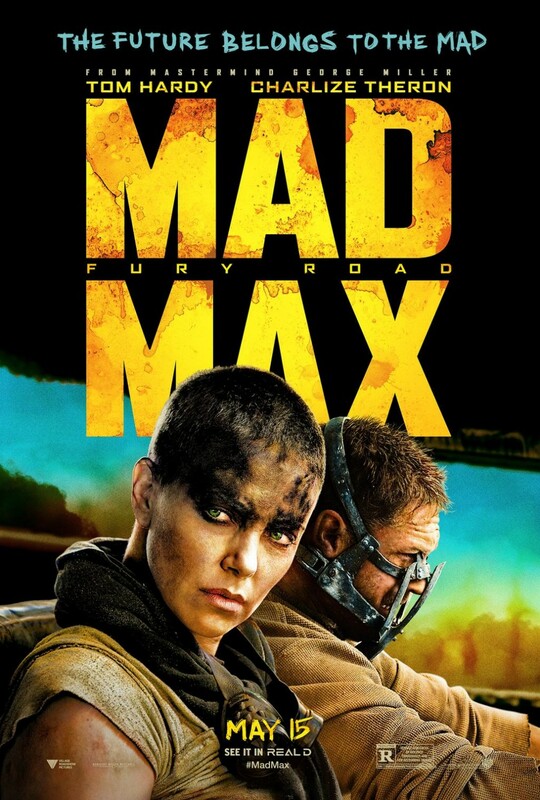 This is George Miller’s fourth film in the Mad Max franchise, and for my money, his best. Long gestating in development hell, Fury Road outdoes Miller’s past films with a scale (both geographic and emotional) hitherto unseen in the series. How best to describe this film? Well, Miller has taken the iconic tanker chase scene from Mad Max 2 and turned it into a movie of its own. Sounds like a two hour movie trailer, right? Guess again. Every single bit of action in this film has been thoughtfully conceived and executed. Miller and his players express so much through the action, it makes you wonder why more action films don’t follow suit. The film fleshes out its world in almost purely visual terms. Crazy white-washed henchmen scream and whoop like zealous crusaders. They’re led by the powerful cult leader “Immortan Joe” (Hugh Keays-Byrne) tricked out in a toothy respiration mask. We first see Joe being fitted for his armor, which covers diseased, boil-encrusted skin. Believe me, Miller knows exactly how crazy all of this is, and he’s milking it for all it’s worth. Believe it or not, it was Mel Gibson who first made the character of Max Rockatansky iconic. This was well before Gibson’s drunken tirades made people forget that he exuded effortless charisma in practically every role. If Tom Hardy doesn’t quite measure up (it may be the film’s one performance I’m not behind 100%), he remains an extremely likable screen presence, embodying raw emotion in his entire physicality. To be fair, this is a more heightened take on the character, with Max’s survival instincts played to garish new heights (or lows?). With his frantic scratching and twitching, Hardy is like a caged rat stuck in fast forward. Survival keeps Max’s demons at bay (namely, the people he couldn’t save in this godforsaken wasteland). This was somewhat true of Gibson’s Max, but with Hardy’s portrayal we can see the actor calculating all of his movements. Gibson was much more natural , suggesting immense emotional traumas simply by loading shotguns or scouring car wrecks for oil. Luckily my reservations about Hardy are pushed aside by the real pleasant surprise of this film, which is that the film isn’t really about Max. Instead, he becomes an ally to the true star: the“Imperator” Furiosa, portrayed by Charlize Theron. Bald headed and smeared in black, toting a mechanical arm, she’s taken it upon herself to transport a group of female refugees (the women who make up Immortan Joe’s harem of wives) to safety. She’s clearly worked her way up the ranks in this place, just so she can betray her tyrannical ruler and return to her home country. You can see the years and experience in Theron’s physical bearing alone. Her grim determination is tempered by maternal grace, paying tribute to action heroines like Sarah Connor and Ellen Ripley. Her authority and prowess in battle is never questioned, either by her peers or the film itself. This is a woman who’s so confident in her abilities that she drives headlong into a sand storm and knows she’ll make it to the other side (and—spoiler alert—does). She’s looking for “redemption,” a simple word that hints at a much troubled and violent past (the screenplay, spare as it is, proves trenchant in key moments). It’s fitting that Miller and Company give her the best line in the film, delivered as the coup de grace. Hollywood needs more heroines like her. Miller surrounds such great characters with great set-pieces to showcase their dramatic chops. He embraces the operatic energy that has been part of the franchise since the beginning, this time with a bigger budget. The action set pieces have real visceral power to them, because they were largely accomplished practically—real stunts, real people. The editing is smooth and jumps seamlessly from action and action, and you’re never lost as to where cars are at any given moment. Every shot and action serves a purpose; nothing is extraneous. Every collision, gunshot, and dent is percussion, part of a constant rhythm. All this is done without losing the emotional core of the film. You’ll pardon if the film looks slicker and more beautiful than any Mad Max film prior; the grit and grime of Mad Max 2 has now been aestheticized because Miller finally can. Shot by cinematographer John Seale, the film has an epic scope that makes it look like Lawrence of Arabia on acid. The aforementioned sand storm (where most directors would have set their climax, but Miller has so many other impressive set pieces up his sleeve) looks like something from a Renaissance painting, as lightning destroys cars in a blaze of bodies and metal. Miller has similarly plied his creativity to his villains, with one rival gang driving spike-covered buggies that look like high speed porcupines. Then there’s the gun toting “bullet farmer” who wears a cowl made of ammunition. Or a Boss Tweed lookalike, complete with gold pocket watch. These details tell you everything you need to know about this strange world in which humanity has begun to rebuild itself. What’s even more refreshing is the group of women whom Max, Furiosa, and Company team up with toward the middle of the film. Most of these women are older, marked by time (an interesting counterpoint to Immortan Joe, who tries to hide his age) and a largely nomadic existence. When one of the women talks about headshots delivered to unfortunate passers-by, you’re shocked to the core—I certainly can’t remember the last time I heard such a line delivered by an older female character. It’s not that Miller portrays the women as more competent than the men, but as competent for sure. Even Immortan Joe’s wives become much more active as the journey goes along. There’s personality and and verve to each of them (indeed, they’re key to the film’s cathartic climax). Women haven’t exactly gotten fair treatment from Miller in the past (with the possible exception of Tina Turner as Aunty in Beyond Thunderdome), and this film may very well be his apology for past wrongs. I could go on and on about this film. I haven’t even mentioned Nux, a key character played by Nicholas Hoult, who makes a great film somehow greater. I haven’t had this much affection for an action movie since Terminator 2: Judgment Day. Fury Road boasts more personality per frame than most movies manage in an entire run time. Your move, Star Wars.